In the 1960s, this extraordinary 100-acre property in Nanyuki, close to the slopes of Mount Kenya, was a magnet for Hollywood’s all-stars and many of the world’s celebrities. Membership was strictly invitation only, and it was, hands down, one of the most exclusive private clubs in the world. 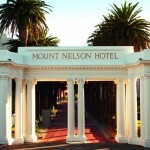 Today though, the only membership requirement you’ll ever need is a Fairmont reservation number. With its manicured lawns, lakes, strutting peacocks and magnificent views of Mount Kenya, I can certainly sense the history. But there is something even more special going on here. 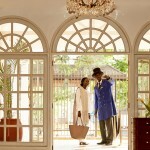 Past the lobby and into the colonial style courtyard, a single straight path runs down into a rose garden tucked away discreetly behind a low wall. This is the Equator line. At a latitude of exactly zero degrees. 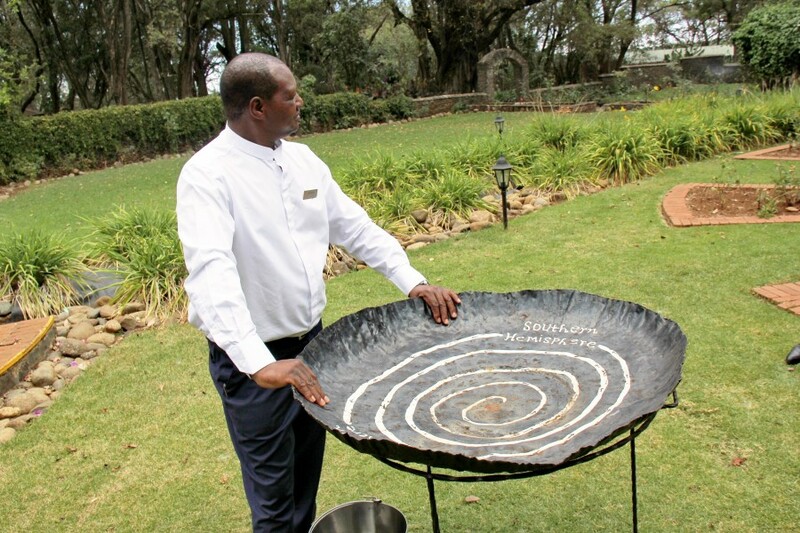 All of a sudden the Mount Kenya Safari Club takes on a much more mystical quality. There are forces at work here far greater than mere humanity, for depending on which side of the Equator line you stand, water spirals away either clockwise or anti-clockwise. This is delightfully demonstrated to me in a small ceremony in the rose garden that is almost an homage to the hotel’s own Hollywood roots. There’s a red carpet, of course, a troupe of tribal dancers and a demonstration of water spiralling both ways as we step across from the northern hemisphere to the southern. No paparazzi sadly, just a troupe of Sykes monkeys grouped along the top of the garden wall looking distinctly unimpressed with my potential celebrity status. Back to the main house now and it’s a throwback to a bygone era. Images of past Hollywood visitors line the walls, Holden’s famous watering hole, The Zebar is empty and silent now, but it’s on my list for a sundowner later. 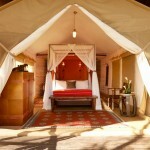 Tusks, the hotel’s restaurant is beckoning me for a buffet lunch, but first a visit to my room. A fancy staircase takes me up a level to my signature suite the Ray Ryan Room; huge four poster bed, wood burning fireplace, small office off to one side, marble encased bathroom off to the other. But my word what a view. 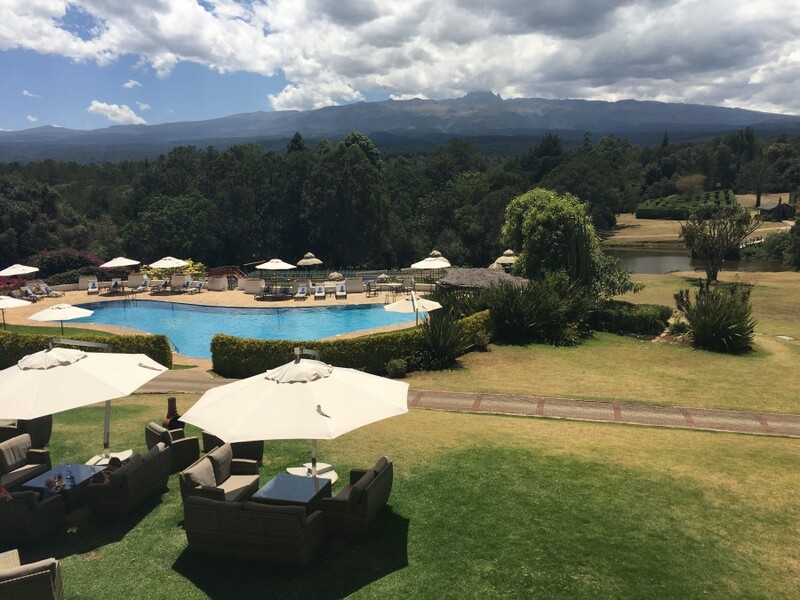 A pair of French doors leads out to a balcony terrace overlooking the whole estate, the peak of Mount Kenya standing silently in the distance lightly shrouded by cloud. This more than exceeds my expectations of a home from home. Back downstairs and lunch out on the Tusks terrace. A buffet fit for royalty runs the length of the room; from the fresh crunchy salads to the indulgent desserts strategically tucked away at the end. Clever that. The hike across the entire room to the desserts makes eating them somewhat less guilty. 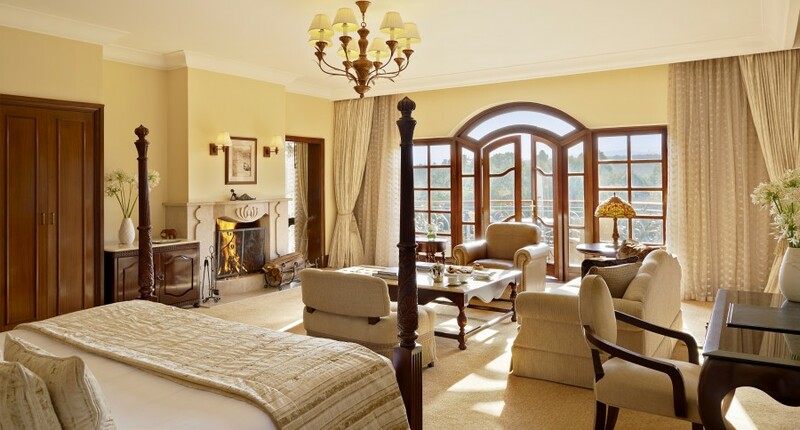 There are 120 guest rooms stretched out all over the estate, rooms and suites in the main house, cottages and lodges throughout the woodlands and 9 hole golf course surrounding the lawns. Interestingly, William Holden’s cottage features a standing telescope, recalling the times he used one just like this to spy on his prestigious guests partying in the Zebar. Speaking of which, it was high time I had a drink in this famous watering hole. The bar is in the northern hemisphere and the tables in the southern, so my drink has to journey across the equator to reach me. As does the bar staff who frequently make the trips without so much as a dizzy spell between them. Within the grounds of the club is a stable for those of an equine bent. And let’s face it, with endless savannah on the doorstep, taking a trot or a game drive amongst the wildlife seems an immensely civilised way to pass an afternoon. More importantly, perhaps, there is an animal orphanage here too, managed by the William Holden Foundation. 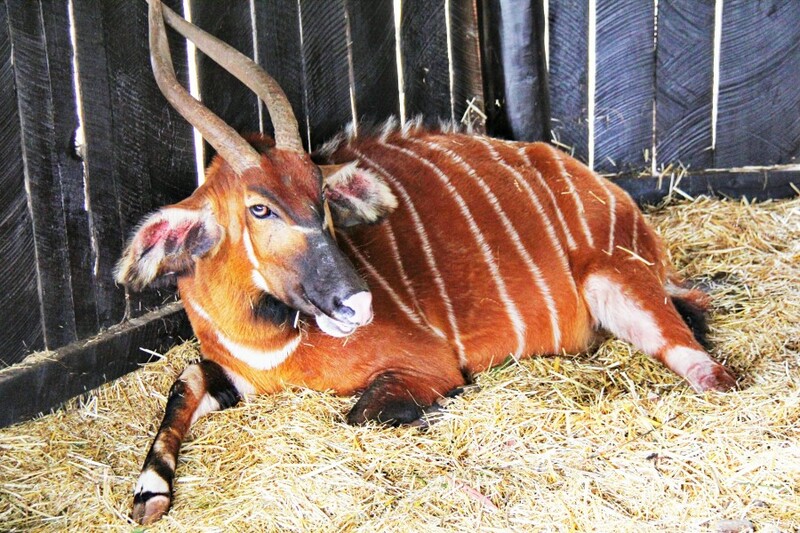 As well as having varied furry guests of its own (although these residents are perhaps a lot less salubrious than the Club’s) its main focus is the care and re-introduction of the endangered bongo antelope. Guests are welcome to visit the orphanage for a small fee and enjoy a guided tour. As night falls, new sounds emerge from seemingly everywhere as day creatures retire and nocturnal ones awake. I sit out on my balcony and watch the change of the wildlife guard with interest. A new day dawns with a treat. Not a standard dining room breakfast for me. 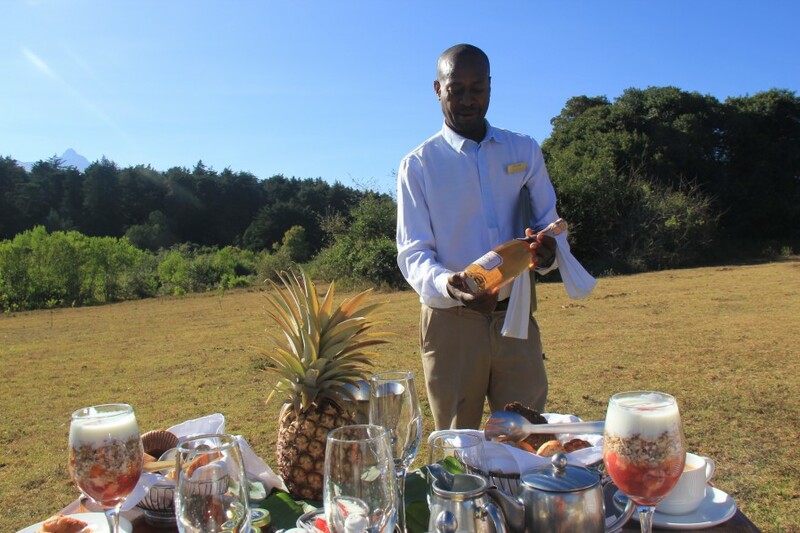 I jump into a landrover and a short drive later I’m out on a ridge high in the Mount Kenya National Forest enjoying a silver service breakfast by the slopes of Mount Kenya. Guests can elect to hike or ride on horseback, or like me, just be driven over, but the result is a very special experience. This is a deliciously decadent breakfast, freshly prepared in a tiny prep area hidden in the trees with a single gas burner. Chilled prosecco and orange juice and an array of succulent dishes, all under the careful watch of a couple of armed rangers. Trust me. This is an experience not to be missed. Tempting though it is to simply remain at the Mount Kenya Safari Club and graze just like many of its non-paying neighbours, I tear myself away to pop into town for a sample of local colour. 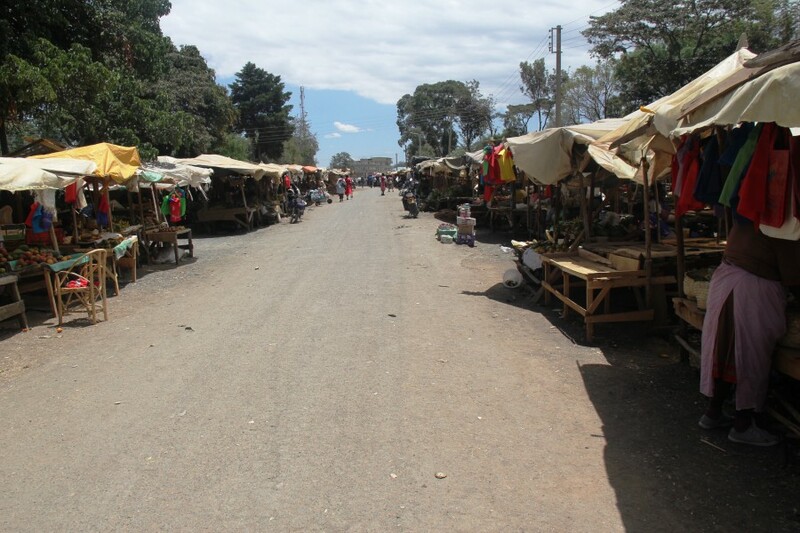 Nanyuki is a small market town first settled by British settlers in 1907 but these days it’s mainly used as a base by trekkers looking to climb Mount Kenya and the British Army which still runs training exercises on the mountain. 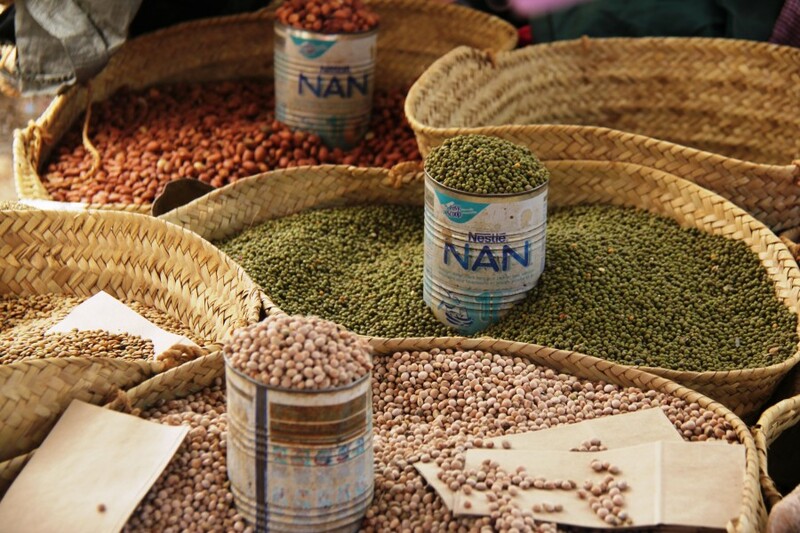 The market is an authentic slice of local life. Colourful stalls selling all kinds of foodstuffs and leather goods. It might feel a little disturbing but Daniel who is showing me around tells me “Don’t worry. People will stare at you but that’s all. 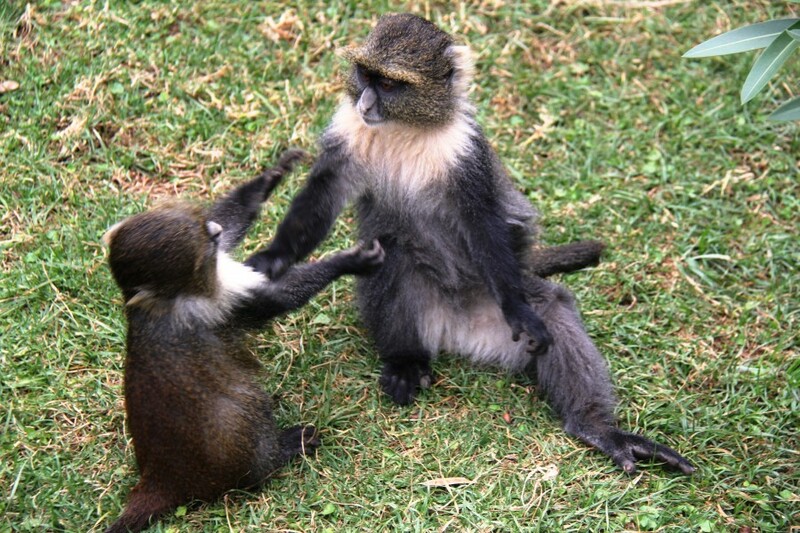 They just find you interesting.” Bartering is standard procedure, but I hand over some shillings as a token to take pictures. 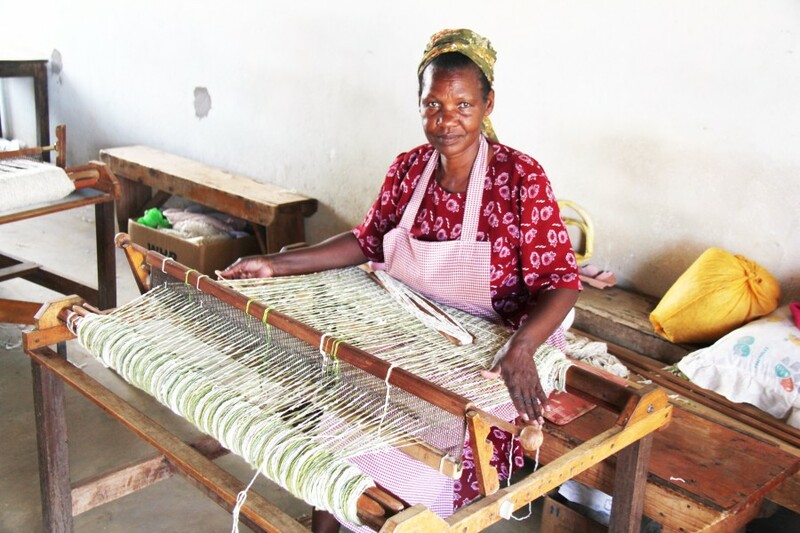 The Nanyuki Spinners and Weavers is a craft cooperative that has been providing self-help employment to over 100 local women since 1977. They create Marino wool from local farmers on hand looms and turn them into high-quality products for sale. Everything from wraps to rugs. Started by the Presbyterian Church of East Africa, to help train poor, widowed and single women from the local villages, it is now a thriving business offering high-quality woollens at a fraction of the cost of similar items in Europe. Back for a sundowner at Mount Kenya Safari Club and the two resident black labradors, Tusker and Grammy have the right idea. Just kick back and relax. I’m sure Mr Holden and his guests would wholeheartedly agree. The Fairmont Classic Bush Safari (2 nights at The Norfolk, 2 nights at Mount Kenya Safari Club and 3 nights at Mara Safari Club) – approx £5,400 per person sharing – full board accommodation inclusive of local flights and transfers. The Slopes Breakfast can be accessed either on horseback or by Land Rover and costs 5,000 Kenyan Shillings (approx £36) per person. Getting to Kenya: British Airways offers direct flights to Nairobi with fares from £474 return and includes its new World Traveller catering.